During advance registration, you can request your fall semester courses through Penn InTouch. The courses that are recorded as your selections at the end of the day on July 13 will be used by the Office of the University Registrar to process schedules. Please note that you are not guaranteed seats in these classes. We recommend that you complete your course requests as soon as possible in case you have questions. If you do not submit your course requests by July 13, you will have to wait until the course selection period begins to enroll in courses. See below for advance registration tips. Beginning July 24, you may add or drop courses on Penn InTouch in real time. You will know immediately if seats in the course(s) are available and if you have been enrolled. Use this time to adjust your schedule if you have not received the exact courses/times you requested during advance registration. Course requests are considered on a first-come, first-served basis during the course selection period. If you are unable to get into a course by the time of New Student Orientation, speak with your advisor. It will help if you remain flexible about your options. 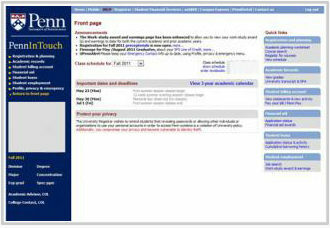 You can search for courses using the Course Search and Mock Schedule tools on Penn InTouch. The Course Search tool allows you to search for courses, view details on individual courses, and save a list of the ones you find most interesting. You can then use the Mock Schedule tool to assist with planning your course schedule. Wharton students are limited to a maximum of 5.5 course units (CUs) for the first semester. A typical course load for first-semester freshmen is 4.5 to 5.5 CUs. See the sample schedule for information on what courses you should be requesting during advance registration for the fall semester. Advance registration is not first come, first served. You can take your time and modify your course selections at any point during the four-week period. If you are unable to access Penn InTouch, send your requests by mail or fax. Fax (+1.215.573.2076) or mail your requests to the Office of the University Registrar by July 13. Input your requests in descending order of priority, so that your top priority is your first request. The system will allow you to re-prioritize your requests during the advance registration period. Your priorities should be based on curricular requirements. If you plan on taking a Critical Writing Seminar in the fall, request it as your first priority. Since they have limited availability (typically 16 seats or fewer per course), Writing Seminars are a priority along with economics, math, and language. Choose the one you find the most interesting and be sure to list an alternate. View the Critical Writing Seminars. Request ALL parts of a course. Some courses (such as Economics 010) have two required parts, a lecture and recitation, with different section numbers. You must request both sections in order to have a valid registration request. Penn InTouch indicates which of the two sections is credit bearing (i.e., has “1 cu” next to the course title). In creating your priority list, request the credit-bearing section before the non-credit-bearing section. For courses that have more than one section (such as economics or math), you do not need to request an alternate section. The registration system assumes that you need such courses, and therefore will make every attempt to satisfy your course request. When you receive your course confirmation, however, you may find that your enrolled section is different from your requested section. You can request courses with back-to-back times. Course times appear directly adjacent to one another. However, courses end approximately ten minutes prior to the listed times. You may not register for courses with overlapping scheduled times. The registration system will block your enrollment in one of the courses if you request courses with conflicting times. Consider taking a Freshman Seminar. Freshman Seminars provide students with the opportunity for close personal interaction with a faculty member in a small-class setting devoted to a significant intellectual endeavor. They may also fulfill General Education and/or Cross Cultural Perspective requirements. Do not register for any courses on a pass/fail basis other than Wharton 101. Other than WH 101, which can only be taken pass/fail, freshmen must take all courses for a normal (letter) grade in the first semester. Do not panic if you do not get all of your requested courses. Advance registration is just the first round of choosing classes. You can also work with your advisor on adding the courses you need during the course selection period. The course selection period is first come, first served. Starting on July 24, registering for courses will be in real time.